We spent a year training our minis. 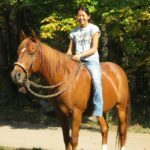 The year began with gaining the trust of the horses. We exposed them to different settings, spooky objects, strangers, loud noises, and challenging situations. 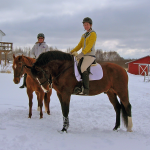 Visitors to our stable, who had a variety of equine knowledge, were put to work helping us socialize our horses. 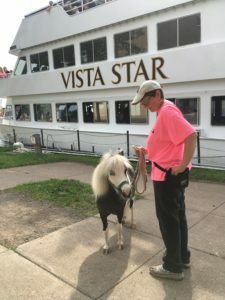 We visited businesses such as Petco, Pet Smart, Fleet Farm, Dan’s Feed Bin, and Mac’s Landscaping Center where we spent as much time as possible getting our minis to interact with people of many different ages. 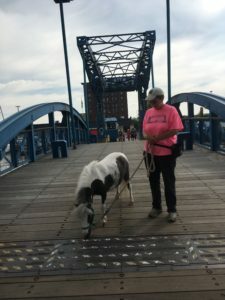 We walked the busy downtown streets of Duluth and the Lake Walk greeting tourists. 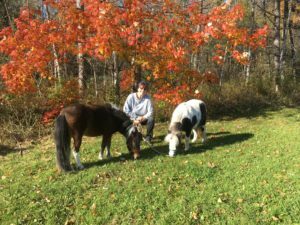 We also took the miniature horses on trail walks at Spirit Mountain and the parks in Duluth. Maggie is registered with the American Miniature Horse Association. Her registered name is Tjeerdsma’s Cookie. She was foaled 5/3/2003 and is a palomino with a white mane and tail. She stands thirty-four inches tall. She was very shy when she came to our stable in October of 2016 and has developed into a warm, loving miniature horse. Gracie is registered with the American Miniature Horse Association. Her registered name is Qtrraes Mystic Grace of Boss. 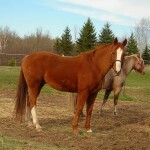 She was foaled 4/30/2011 and Maggie is her dam. Gracie is a dun with black mane tail, socks and a star. She is thirty-four inches tall. Gracie has developed into a fun, loving, and gentle miniature horse. Spirit was rescued by Skyview Ranch in Farmington February of 2016. We brought her to our stable in April of 2016. The vet estimated her age at five years old. Spirit is thirty-four inches tall and is a paint with stunning blue eyes. Spirit was not handled very much but she is a quick learner and has become a warm, loving miniature horse. 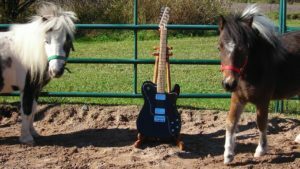 We are hopeful she will become part of our miniature horse therapy program. Dakota was rescued by Skyview Ranch in Farmington February of 2016. He was brought to our stable with his dam, Spirit. 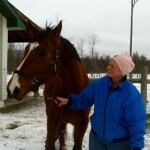 He was gelded at Skyview Ranch and the vet believes he was a year old when rescued. Dakota was twenty-eight inches tall and is still growing. He is a paint with his mother’s blue eyes and had not been halter broke or handled. 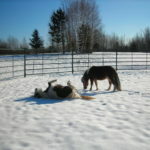 We hope in another year or two that he will also become a part of our miniature horse therapy program. 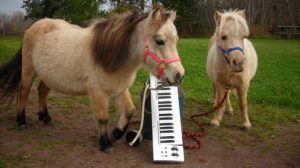 If you would like our miniature horses to come visit you or attend a community event contact us. We would be happy to meet you. February 21, 2018 Outreach Visit to UMD Kirby Student Center 11:00AM-1:00PM Beth and I were excited to be invited back to another UMD PAWS Event. A big snowstorm the day before did not stop us. It did however make it very slippery for Beth and I and the minis walking on the shady UMD sidewalks where the sun could not melt the ice. So once again I came early to help Beth clean stalls and get ranch work done. We needed to have the minis loaded and be off by 10:00AM. Things ran smoothly. We kept to our time schedule. We were worried a bit that the minis might be sore due to dental work Monday. The dentist said the anesthesia would be out of their bodies by Wednesday, the day of this event. She gave her approval for the minis to attend. Again UMD was very accommodating. They gave us the same parking spot as last time. Beth took Gracie down the elevator to the Kirby Center. Then it was my turn. When the elevator door opened it was full of people going up to the third floor. I pushed the down button again. Of course, while Maggie and I waited for the next time the elevator door would open, a crowd gathered. The elevator door opened once more but inside was a professor with a cart. The look on his face was one of surprise. He said, “I cannot believe what I am seeing.” He pushed his cart out of the elevator. He petted Maggie as he asked questions. Then he looked around, “I am on the wrong floor.” He pushed the elevator button and went back into the elevator with his cart. Maggie and I could not fit. For the third time I pushed the elevator button. All this time students surrounded Maggie. When the elevator door opened I told the students Maggie and I had to go downstairs. We got into the elevator. Instead of going down we went up. The door opened to the third floor. Maggie knew the routine to step out to a waiting crowd of her FANS but I had to hold her back. Maggie and I never get tired of the different facial expressions, laughter, smiles, and wonderment of the surprised people seeing a mini horse in an elevator. I told the people we were on the wrong floor. We needed to go down to one. People were very nice and let me shut the door. Maggie understood as well. We went with a bit more speed of a nonstop elevator going down 3 floors. I was prepared for the bit of lift as the elevator stopped but this was Maggie’s first time. She tensed up, shook her head, and looked at me. I gave her verbal reassurance and a treat for keeping her composure. The doors opened. Maggie stepped out. One guy, who remembered Maggie from our last month’s visit, asked Maggie if she remembered him. Again it is so much fun to hear the one sided conversations over the phone of a person who is so excited that they have to call someone to tell them, “There is a horse down here. Yes there is. In fact there are 2 horses in the building. I am not kidding. Come and see for yourself.” I could tell that Maggie was still sore from the dental work when people tried to pet her face. I explained the dental visit she had Monday which led to lots of questions why a horse needs dentistry. People followed my lead when I asked them to pet her just on her back. Most people did as I requested but a few could not resist her cute face and nose and the softest lips. After 45 minutes, I signaled to Beth that the minis needed a break. We went to the van. During the 15 minute break, Gracie pooped in the front of the van by the cage separating us from them, and Maggie pooped in the back by the shut doors. Beth and I were happy. We thought both peed too. Then we went down for another 45 minutes. The PAWS program has a special place where the pets can be petted. There is a door to the outside for the dogs to take a break and do their business. We were told we could bring the minis out there to poop and pee but our minis have been trained to poop and pee upon request on sawdust. The sawdust is in the van with peace and quiet. That door out on the snow would not work for us although it would make it easier for us. Gracie was a star. She stood so still for the whole event. During the second half of the event, Maggie got antsy after 30 minutes. My first reaction was to try to reassure her. That did not work so we went for a short walk to get out that energy. Maggie continued to be antsy. I walked over to Beth, telling her that Maggie had had enough petting. We took the minis to the van. As soon as Maggie got into the van, she peed up a storm. I realized that was what she had been telling me in the only way she could. Thank goodness I was in tune to her behavior, just knowing that something was bothering her and we needed to leave. I was very proud of her for holding it on the wait for the elevator, the walk out to the van, and the unlading of the ramp. Maggie and I learn a lot at each outing, making us a better therapy team. I realize how smart Maggie is and to trust what her body language is telling me. I learned not to get upset when her actions are not what I expect but that there is a reason for it and it is my job to find that reason. I also learned that she really tried to hold her pee. She knew the difference between work and play. Maggie is learning that I am getting better at being in tune with what her body language is telling me, that I will intervene when necessary to keep her safe, and that her needs come first over the event. As we drove away, Beth and I thanked the minis for giving us a very enjoyable, wonderful, accident free visit. Once again we were shamelessly giddy. We decided to celebrate by getting tea at Caribou and turkey bacon spinach wraps at Subway. The minis got to snack on fresh hay. Later that night, Beth texted me at 9PM that she had seen Maggie on TV. She texted me again the next morning that Maggie was on TV again. The PAWS event was on several channels. Beth also called me again to tell me that Gracie was also on TV, a cute shot of her in the elevator. January 23, 2018 Outreach Visit to UMD Kirby Student Center 11:00AM-1:00PM This was a PAWS Event. PAWS stands for PET AWAY STRESS. Pat Castellano, the Pet Partners test evaluator sent Beth and me an email asking us to come to this event. We were thrilled to accept the invitation. We took Gracie and Maggie on their first outing as registered therapy minis. 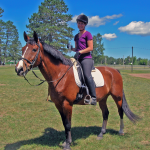 Beth was the handler for Gracie. I was the handler for Maggie. Our job was to relieve the stress of students studying for their finals. Our day started at 7am to get the mini stalls cleaned. Then it was time to run the minis so they would release some energy. We gave both minis a waterless bath Monday and again this morning because Monday night Maggie had lain down in some manure so her belly was crusty plus there was also a big manure stain on her face. It all came out with Beth’s 30 minutes of hard scrubbing. Also not to be out done, Gracie rolled in her stall this morning, getting her coat full of barn dust and shavings. So I worked on the bodies of both minis and Beth did the mane, tail, forelock, and bellies. Then it was on to the feet. Beth picked them, scrubbed them with a brush, and took a towel to their hooves. We warmed up the van, got dressed in non-smelly clothes and loaded the minis into the van. Monday we got the van ready with sawdust and hay. I also had previously driven to UMD to scope out the parking and find the Kirby Student Center. I timed the trip from the barn to the Center. It was a 22 minute drive. Beth drives a bit slower than I, but today she put the pedal to the metal. Really she drove the speed limit and we got there in 22 minutes. We were both shocked. We had 25 minutes on our hands. We took several driving tours around the university. Beth had been an instructor there. Our 25 minutes of touring ended at 10:30 when we spotted the PAWS coordinator who told us where to park. The good thing about our parking space was that it was a few feet from the door we needed to enter. The bad thing was that we were right on the very busy Kirby Drive, which is the main thoroughfare for the busses and cars. Our ramp stuck out a little bit in the road and our minis were coming down the ramp into the road. We handled it well by waiting for an opening in traffic. Maggie came out but then a car appeared but she stopped and waited for us to get Gracie out successfully. As the busses drove by they were loud and noisy. Gracie was a bit unnerved but handled it. I took both Gracie and Maggie for a walk to get them calmed down and get used to all the noises. Beth cleaned the van a bit. Then it was time to go in. We had directions to go in, take the elevator down to the first floor and take a right. Our minis had never been in elevators before but Beth and I had built such trust with these minis that we knew they could do it. I had suggested that we take 1 mini at a time in the elevator. I did not want one mini freaking out the other one. I pressed the elevator button but it was taking a long time so I started walking Maggie around the lobby. Students came up from downstairs, saw our minis and a crowd gathered. Pictures were being taken. We stood there for 20-25 minutes. Beth and I could not believe the crowd. Both horses handled it well. Finally we just had to get downstairs so I explained that to the crowd. I pressed the elevator button. Maggie and I got in. I turned her so she faced the door. When the door shut completely, Maggie realized she was in a box all closed in. I clicked and gave her a treat for reassurance. I pressed the down button. She stuttered once to get her balance but remained calm. The door opened and we walked out. We only got a few feet from the elevator and Maggie was surrounded by students. Maggie handled it all so well. Once in a while I gave her a click and a treat. This was to let her know that she was doing what she was trained for and doing it well. Then Gracie came down the elevator without any problems. She also was surrounded by students. Beth said Gracie was wonderful. She stood patiently and allowed everyone to pet her, rub her forehead and braid her mane. She stood still and was more patient than she ever though she could be. Maggie did the same. People were so amazed that a year ago Maggie would not tolerate anyone touching her. When a student accidentally dropped a water bottle hard on the floor, Maggie did not flinch. She did flinch about 7 times when the people petting her shocked her. The air was very dry there. Each time Maggie got shocked she would raise her head to look at me for reassurance. Then I would give her a kiss on the forehead. Some dog lovers in the group commented that they kiss their dogs in the same spot. When I felt Maggie needed to move a bit to get some release from the crowd, I would tell the students that Maggie needed a walking break. It was so nice to hear the sharp staccato of her hooves. I took her up a ramp where people were studying quietly. They did not pet her but only smiled. One time Maggie stood at a window looking in where a meeting was going on. One guy saw her. His facial expression was hilarious. He must have told everyone and the whole room turned towards the window with more hilarious facial expressions. HEE HEE! After 45 minutes, I told Beth that Maggie needed a break, both for peace and quiet and to pee. Again we rode up the elevator, one at a time. The minis got in the van for a 15 minute rest. We heard the minis pee and one pooped. Beth and I also sat in the van, going over how unbelievably well the minis were doing. Then it was back to traffic control as again the minis came out of the van. While Beth cleaned the van a bit, I took both minis for a run to expel energy. Maggie and I once more rode the elevator down with a young gentleman. I had asked him if that was ok if Maggie and I joined him. He said yes. While Maggie and I were in the elevator with him, he kept saying, “This is so cool. I never expected I would be doing this.” In fact he stayed with Maggie and me for about 30 minutes asking great questions about horses and donkeys. He just fell in love with Maggie. Students were thrilled. Most had never petted a horse before. There were lots of selfies taken. I explained to the students why I was glad the new phones did not have to flash. Many said I have to text so and so to get the down here to see the minis. The students were very complimentary. They loved Maggie. When a compliment was given I would tell Maggie, “Did you hear that? Then I would repeat the compliment. Students would smile. Many students stated what a stress reliever this was. The UMD organizer came over to tell us how well she thought this was going. They had never had such big animals do this. The students had also told me that they were really surprised to see us there. Gracie was also such a big hit. She and Beth were an incredible team. Gracie has a bit more energy but Beth gets the best out of her. When we got outside I decided to walk Maggie and Gracie before putting them in the van for the ride home. They had stood for so long. Beth and I were so proud of our horses. We were in awe to see how well a year’s worth of training worked. It was incredible. Glitch 1: I had not used the van for a while and forgot to duck when I brought Maggie into the van. This is not the first time I have gotten a knob on the top of my head. I just do not think. Glitch 3: Beth and I were so busy with the crowds that we did not have time to take off our jackets or winter hats. After 2 hours I looked in the van mirror to check my hair… My wool ski hat had been on backwards the whole time with the tag out front. Maggie did not tell me and neither did Beth. I wondered why the ear flaps felt off and the string ties more in my face. Glitch 4: Beth did a great job of cleaning the horses’ hooves after each break from the van. However the last time Beth and I went in, Beth just happened to look back to see and gasped. I looked at what she saw, 8 little manure tracks. Oh no…how could this happen…It wasn’t the minis….it was ME. When I loaded the minis the last time, I stepped in a pile in the van. Beth and I sheepishly ran to the van got a brush and dustpan to scrub up my manure tracks. As we are running to the door hoping to get the manure off the carpet before any one sees it, Beth yells at me to stop. She looked at my shoes. “I have to clean those.” she said. I walked back to the van, raised each leg so she could pick my feet and wipe them off with a cloth. I am thinking if people walk by, see me leaning on this post with my leg bent backwards, with Beth bending down picking my boots, and they are not horse people, they are going to wonder. Then we raced to the entry way and brushed up the pieces before anyone saw them. Now I know how a horse feels when they we pick up their back legs to pick their hooves. Walk With Me™ is a special initiative of the Pet Partners Therapy Animal Program to promote human health and well-being in our community. 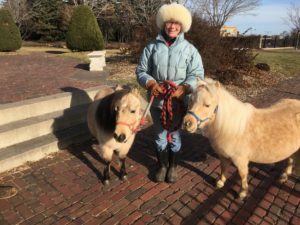 We invite families, nursing home residents, school children, and park and recreation groups to take a walk with our miniature therapy horses in a fun, healthy atmosphere. Read With Me™ is a special initiative of the Pet Partners Therapy Animal Program to promote increased reading skills in our community. 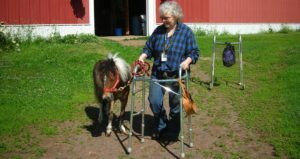 We invite people to read to our miniature therapy horses in a fun, relaxed setting.